Ghent was once the second largest city in Northern Europe, only behind Paris. It achieved this status in the Late Middles Ages as a result of the prosperity it achieved in the cloth trade. The marshy land around Ghent was good for raising sheep. The sheep yielded wool, which the locals turned into cloth. Indeed, they got so good at it that Ghent began to import wool from England and Scotland to turn into finished cloth. All of this was facilitated by Ghent's access to the sea. Although plagued by wars and religious strife, Ghent continued to prosper until the late 15th century when its access to the sea via the Scheldt River ended due to silting. Ghent, however, saw a revival after the French Revolution. The French, who occupied the area during the Wars of the French Revolution and subsequently under Napoleon, brought new personal liberties. In addition, the benefits of the Industrial Revolution came to Ghent during this period when Liven Bauwens smuggled the plans for a cotton mill out of England and established in Ghent the first modern manufacturing facility in continental Europe. Other mills and sugar refineries followed. Meanwhile, a new canal once again gave Ghent access to the sea. From 1815 to 1930, the population of Ghent tripled. However, poor working conditions led to the formation of the first trade union in Belgium. Ghent was occupied by the Germans during both World Wars. However, it suffered relatively little bombing. As a result, most of its historic architecture was preserved. In some ways, Ghent is similar to Bruges. Both cities were important trading centers in medieval times and much of their medieval architecture has been preserved. Both have a network of waterways that enhance their beauty. However, Ghent is not as dependent on tourism as Bruges. 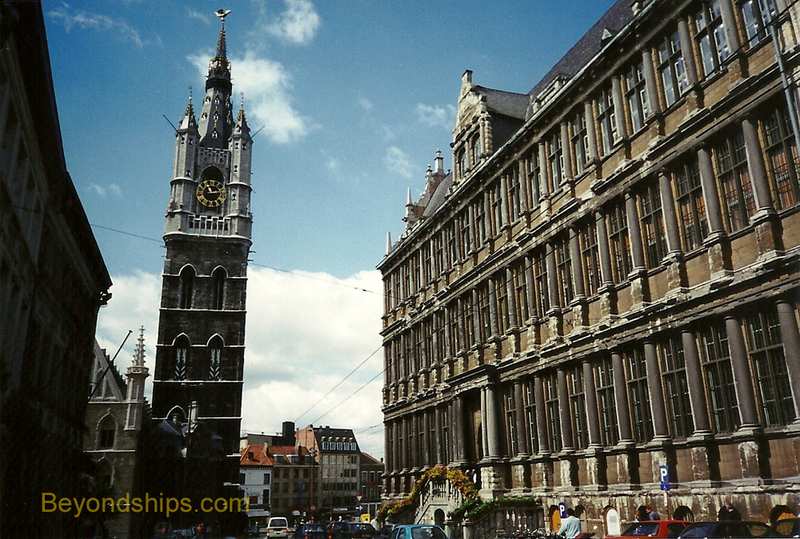 It remains the third largest port in Belgium and is the home of an important university, the University of Ghent. Thus, while Ghent is tourist friendly, it is not as geared toward tourism as Bruges. Ghent is approximately 40 miles from Zeebrugge. Cruise ships calling in Zeebrugge often offer excursions to Ghent but not as many varieties of tours as are offered for Bruges. Passengers can also travel independently to Ghent by taking a 50 minute train from Blankenberge station through Bruges to Ghent's Sint Peter station. Trams run from there, into the center of the city. The distance is less than a mile and a half so walking is an alternative. Most of the attractions in Ghent are in close proximity in the center of the city. It features medieval architecture, cobblestone streets, museums, shops and cafes that spill over onto the street. Much of the area is pedestrians-only. The Three Towers of Ghent defined the city's skyline in its golden age. They also give the flavor of the attractions to be seen in Ghent. The oldest tower sits atop St. Nicholas Church. It was paid for in part by the city and was used as an observation post and belfry. Unusually, the tower does not sit above the entrance to this Gothic church but above where the nave and the transepts cross. The church was begun in the 13th century. Later, chapels that had been used by the local guilds were incorporated into the church. In 1313, work was begun on a new watchtower. 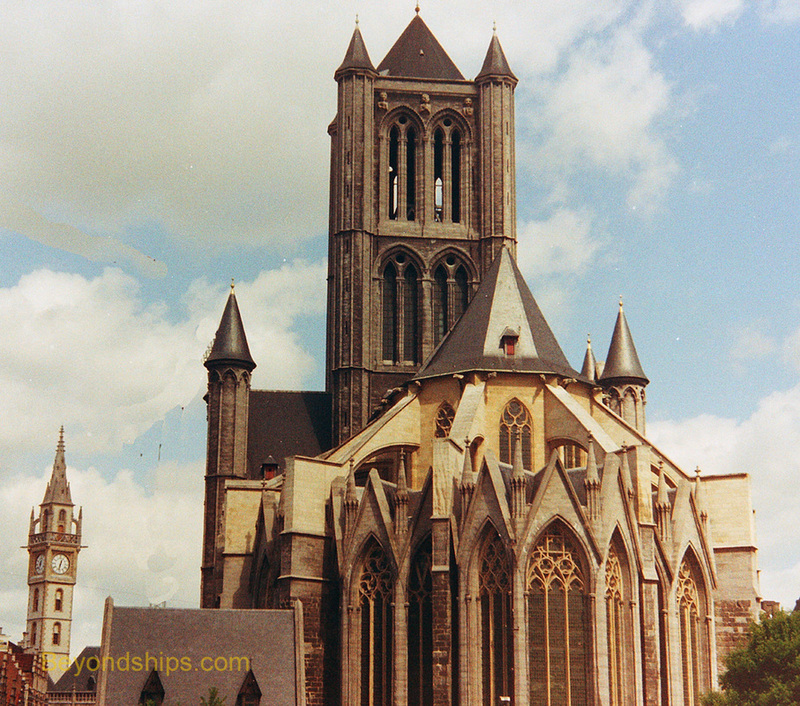 Finished in 1380, the Belfry of Ghent is the tallest belfry in Belgium at 320 feet. It contains 54 bells, which not only mark the time but play arias controlled by a clockwork mechanism housed in the fifth floor of the tower. The most famous of the bells is called Roland, which warned of approaching enemies and announced victories. Atop the tower is a golden dragon that has become the symbol of Ghent. 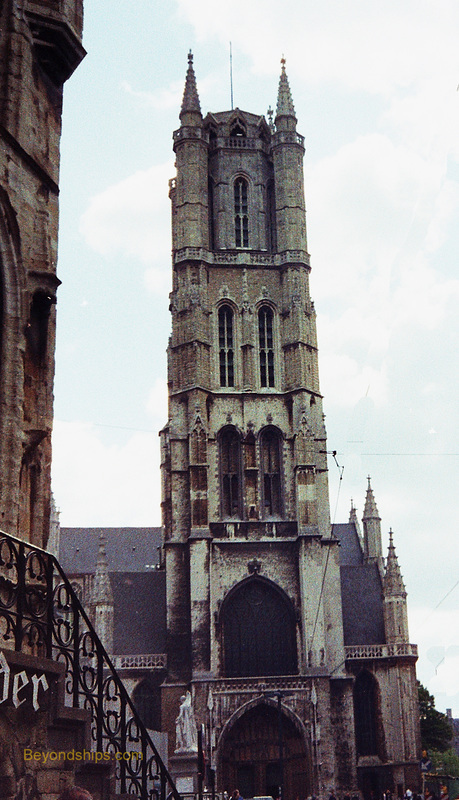 Unlike the belfry in Bruges, the Ghent Belfry is not atop the Cloth Hall but beside it. Built after the Belfry, the Cloth Hall was the center of Ghent's cloth industry. Purchases and sales were negotiated here, goods were inspected and sometimes stored here. The third tower belongs to St. Bavo's Cathedral. Replacing a Romanesque church, the current Gothic structure was constructed between the 14th and 16th century. It became a cathedral in 1561 and is where the Holy Roman Emperor Charles V was baptized. Today, the cathedral is primarily known for its artwork. The collection includes “The Entry of St. Bavo Into The Monastery” by Sir Peter Paul Rubens as well as the “Calvary Triptych”by Justus van Gent. However, the most important work is the “Adoration of the Mystic Lamb” by Hubert and Jan van Eyck. An altarpiece done in several panels, the work is considered to be the height of Northern European Renaissance painting. For such a peaceful painting, the Adoration of the Mystic Lamb had a tumultuous history. It was taken to Paris by French Revolutionaries. Later, some of the panels were sold to German collectors. When World War I came, the Germans requisitioned the remaining panels and took them back home. At the end of that war, Germany was required to return all of the panels including the ones that were purchased legitimately. As the Second World War approached, it was decided to send the painting to the Vatican for safekeeping. However, the painting was intercepted by the Germans' Italian allies and eventually turned over to the Nazis. It was recovered at the end of the war. There is no entrance fee for the Cathedral. However, there is a charge to see the Adoration of the Mystic Lamb.